Vanner Farm is a working farm on the banks of the river Mawddach in the village of Llanelltyd and two miles from the market town of Dolgellau. The beef and sheep farm runs from sea level, where the river Wnion joins the Mawddach, to 1,000 feet where the prestigious Precipice Walk crosses a section of the high pasture land. The panoramic view from this location includes the magnificent Cader Idris range and the beautiful Mawddach estuary winding its way to Cardigan Bay and the seaside town of Barmouth, where you can relax on its beautiful beaches. The Welsh Cycle Route runs through the farm and leads directly to the internationally renowned mountain bike centre at Coed y Brenin, a distance of five miles. The north end of the Mawddach trail which runs from Dolgellau to Barmouth is only a mile away. This makes the Vanner Holiday Cottages the perfect location for a walking or cycling holiday. 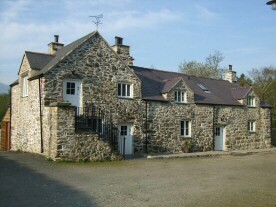 The newly converted semi-detached holiday cottages are stone built 16th century listed buildings situated within a conservation area which includes the 15th century Vanner Farm House and Cymer Abbey, the ruins of a 12th century Cistercian monastery under the jurisdiction of Cadw Welsh Heritage.